Hailee Busk and her family. 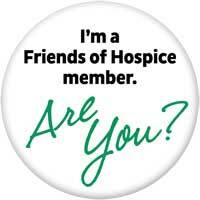 Friends of Hospice is a new non-profit membership-based organization in Central Oregon. Anyone can join with an annual household membership of just $25 a year. There are benefits galore in the form of business discounts, an InfoChat phone line, and educational and social opportunities. So jump on in to this new group where you can express your appreciation for hospice care, and perhaps even change the narrative around end-of-life matters. TALK, PLAN, LEARN, and LIVE! All activities sponsored by Friends of Hospice align with these four areas of focus: TALK, PLAN, LEARN, and LIVE! Members believe in the value of hospice care at the end of life, and want to live fully until that time comes. We want to TALK about end-of-life issues in order to gain clarity and make our wishes known to others. We want to PLAN now to be prepared for an uncertain future. We want to LEARN about the dying process and how to navigate the complexities of healthcare. We seek to LIVE life fully—making choices that enrich our lives.